Those of you who previously tried the community preview of PowerRegEx 2014 will notice that we made some significant changes to the tool. The ribbon interface makes it easier to access the application functions and features. The Navigation section allows you to quickly go to a specific line in the document viewer or navigate between your regular expression matches. The Export section allows you to export your regular expressions into a text document. The Windows section allows you to show hidden panels and provides access to the Options dialog. The editor consists of a Regular Expression input line where you enter your expression and a document viewer where the expression is matched against. The document viewer / editor allows you to test your regular expressions against any file. 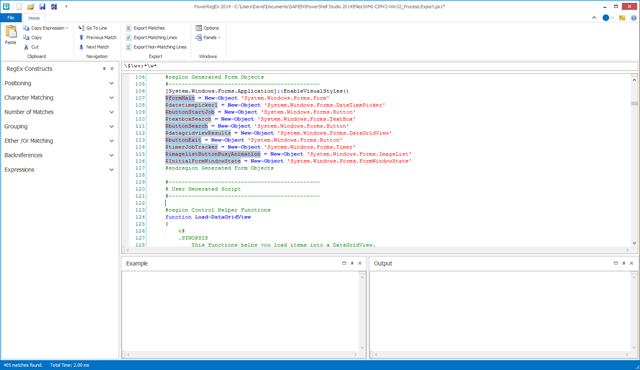 In addition, the view provides syntax coloring for a variety of file types including: PowerShell files, VB files, C# files, bat files, php files, xml files and many more. 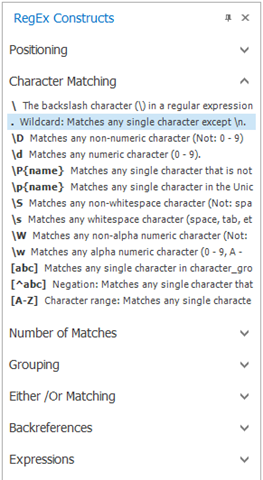 You also have the option to customize the coloring of regular expression matches including the option to choose an alternate color for odd number matches. Using an alternate color scheme makes it easier to distinguish matches that are side by side. New options include the ability restore the last open document and the last regular expression on start up. 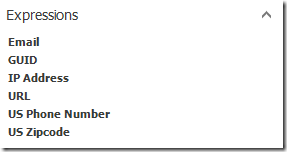 This way you can continue to work where you last left off when ever you open the application. 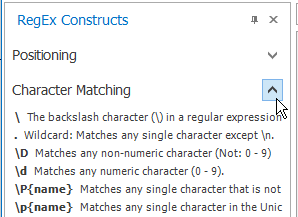 In order to make it easier to work with regular expressions we added a few panels to PowerRegEx 2014. The panels help keep all the relevant information visible at all times without having to constantly dig into a menu. To insert the desired construct into your current expression simply double-click the construct. When you double-click on a predefined expression, it replaces your current expression with the selected expression. You can add your own expressions to the list by using the Save Expression button. All expressions are saved in the snippet format, so that you have the option to import them into other editors if you desire. 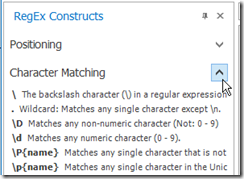 PowerRegEx 2014 automatically displays an example in the Examples Panel when you select a construct from the RegEx Constructs Panel. 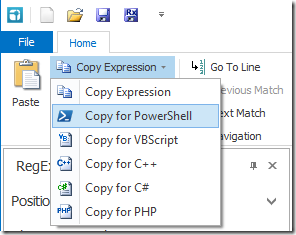 The Examples Panel makes it easy for you to copy and paste the example expressions. PowerRegEx 2014’s status bar is used to display the number of matches found within the open document. As of build v1.0.11, the status bar also displays the total time the RegEx expression query took to execute on the open file. The query time gives you a good indication of the performance of your regular expresses. As you can see we made a lot of improvements to PowerRegEx 2014 since its community preview announcement. PowerRegEx 2014 is part of the SAPIEN Productivity Pack. The Productivity Pack is free for all licensed users of a current 2014 subscription. Don’t have a subscription? You can still purchase the SAPIEN Productivity Pack by clicking here.